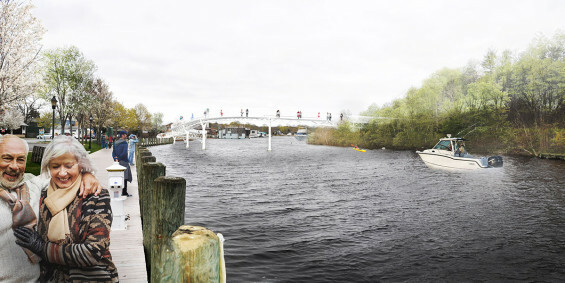 On Long Island’s eastern end, the Towns of Southampton and Riverhead, in Suffolk County, are planning for a new pedestrian bridge over the Peconic River. 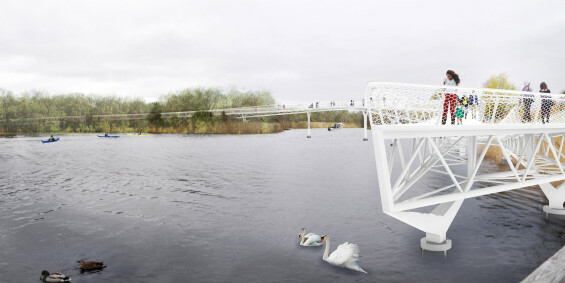 The bridge will serve as a connective public amenity with economic and visitor experience benefits for both municipalities. The walkable link between downtown Riverhead and the primary commercial corridor of NYS Route 24 in Riverside will provide extraordinary scenic views at its apex and will draw tourists to the region to visit the Riverhead/Riverside area. Additional foot traffic will spur economic activity on both sides of the river. The bridge promotes physical activity and environmental appreciation. 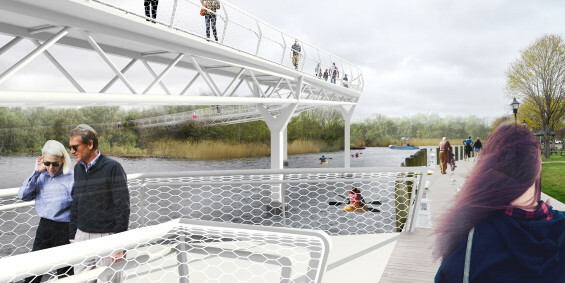 The bridge will offer access from the Long Island Aquarium and other major downtown Riverhead businesses and institutions to Riverside through a natural trail setting along the Peconic River waterfront. 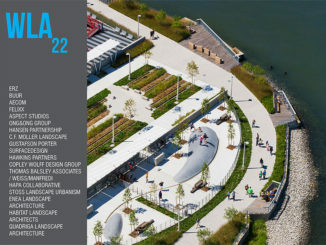 The design was driven by a multitude of conversations and workshops with the stakeholders and community. These interactions resulted in a series of design parameters by which the bridge would be bound. While the pedestrian connection is viewed positively by those affected, the community expressed the need for the riverfront to continue to perform exactly as it does today. This stipulation determined two things | the bridge would need to have a vertical clearance of 18’ at mean high water as to allow adequate clearance for boats to access the slips along the Riverhead boardwalk and the touchdown location on either side of the river was tightly constrained to a small length of riverfront as to not remove any boat slips along the length of the boardwalk. Other parameters include handicap accessibility by means of a series of ramps and landings and minimal environmental impact. The large vertical clearance of the bridge, 18’, coupled with the necessity for the bridge to be accessible by ramps resulted in a total length of approximately 785’. 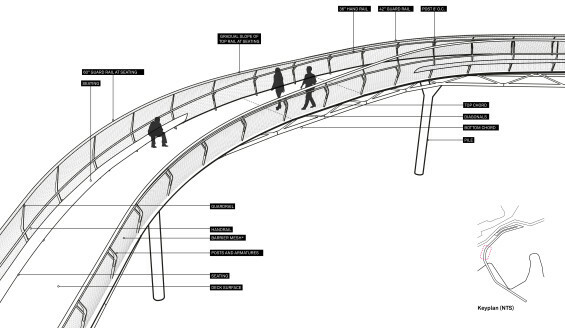 The length of the bridge itself enables a wealth of programmatic experiences along the way. Picking up from Riverhead, the bridge doubles back on itself, bringing the user up close and personal with the structure’s underbelly just prior to the switchback, which provides a lookout point less than 100’ from the start of the bridge. Continuing up the ramp, users will be able to enjoy a new, elevated view of the Peconic waterfront while seating opportunities situated on either side of the bridge provide viewing platforms out towards downtown Riverhead on one side or the Peconic Bay on the other. Descending into Riverhead, the bridge enters the forest in the tree canopy and moves through the trees before it touches down. The connection is unique in that it connects the developed Riverhead downtown to the natural area in Riverside which is slotted to become a future park. The design of the structure involved extensive coordination with structural engineers to develop a system that uses typical construction methods, while minimizing piles (and therefore environmental impact), and not driving the height of the bridge deck taller than necessary. The resulting system is simple, but elegant. The standard truss system was manipulated to distribute loads towards the ends of the bridge using a taller truss that then gradually pinches to a very thin profile in the center. 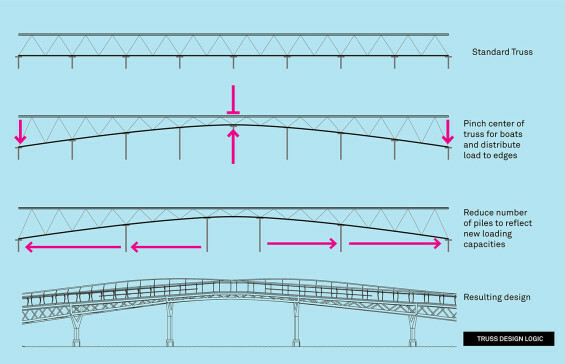 The thick edges along the ends of the bridge allow piles to be spaced as far apart as 100’ and the thin center profile accommodates the required clearance for boats without sending the deck height soaring unnecessarily high. The bridge as a whole is white and uses a UHPC bridge deck sculpted to a knife edge on the sides that will create a clean, thin profile along the length of the bridge. Powder coated posts and rails with a white mesh constitute the hand and guardrail system. The posts bow out which opens up the bridge deck. Additionally, the post system integrates arms to support the seating edge where necessary and gradually pick up height in these areas to accommodate the guardrail requirements from the seat. The effect of the overall bridge is meant to be seamless and simple, as to not distract from the existing beauty of the riverfront. Survey | AIA Engineers, LTD.